An Oct. 8 report by KCET’s Artbound said camping might be in for a new renaissance with cabins that look as good as The Wedge. Artbound, which reports on Southern California’s arts and culture, was effusive in their praise. 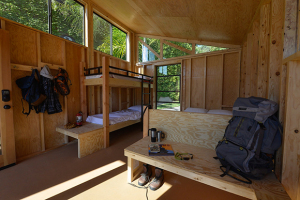 “Most importantly, the cabins can help mitigate the hurdle of purchasing a set of camping equipment — an expense that can be prohibitive to lower-income residents,” Artbound’s Lyra Kilston wrote. Read the report at KCET, a Los Angeles based community television station. The Wedge will be shown at the 62nd annual California RV Show, which runs from Oct. 10-19, in the Gate 9 area at 2200 N. White Ave. at Fairplex, Pomona.